The Cunard liner Lancastria was one of a long list of peace time passenger ships pressed into service as troop carriers during World War II. Early in the war more than 3000 British troops and civilians perished on her decks when the Lancastria was bombed and sunk by German aircraft off St. Nazarine, France. Some believe the number of victims may have been nearly 6,000. The date was June 17, 1940, and Europe was in turmoil as the Nazi army was sweeping Western Europe, defeating the armies of Belgium, Holland and France. As the Germans advanced, there was a mass evacuation of troops and civilians at various French ports. The Lancastria, under the command of Capt. Rudolph Sharpe, anchored about five miles off shore while smaller craft, including destroyers, ferried people to it. Captain Sharpe had orders to load as many troops and refugees as possible and to disregard international law on passenger limits. Thus an 18-year-old liner revamped to carry up to 3,000 troops was packed from stem to stern with an extreme mass of humanity . . . some estimated over 7,000 . . . when the bombers swooped in shortly after 2 p.m. Witnesses told how the skies were full of the sound of aircraft as a nearby destroyer signaled the Lancastria to get under way. At about that time a bomb struck another troop transport, the Oronsay, near the bridge. They said debris fragments fell around the Lancastria. The blast caused many of the troops to rush from below decks to witness the attack. As an air-raid siren sounded from far-off St. Nazaire, Sharpe and the troops on the liner’s deck watched in horror as a German Dornier Do 17 flew out of the sun, its bomb doors open. That bomber dropped a salvo of four bombs that destroyed the Lancastria and sent her to the bottom in just 20 minutes, taking most of its human cargo with her. One of the bombs dropped straight down the funnel and exploded in the engine room. A second bomb detonated in number two hold where some 800 RAF personnel were packed. A third bomb struck number three hold amid 1,400 tons of fuel oil. The fourth bomb hit the water near the side of the liner, the blast blowing a hole in the ship’s side. Smoke and flame billowed from the number two main hatch cutting off any exit for those trapped below deck. Chief Officer Grattidge used a megaphone to order the crew to clear away the life boats. But the liner was listing to starboard so Grattidge ordered everyone to move to the port side and the vessel leveled off for a brief time. Then it rolled over on its port side taking thousands of military men and civilians with it as the Lancastria made its death roll before plunging to the bottom of the sea. Hundreds, if not thousands of people, found themselves struggling in the oil-soaked water. It was a horrific scene of struggling people, floating bodies, overturned lifeboats, wreckage, and dogs. To make things even worse, the Luftwaffe were now strafing the survivors in the water. The destroyers Havelock and Highlander, plus several merchant ships including the Glenaffaric, Oronsay, Fabian and the John Holt, picked up survivors. All told, less than 2,500 survivors were counted out of an estimated 6,000 to 7,000 people packed on the Lancastria’s decks. It was counted as the fourth worst shipping loss in terms of human life in the Twentieth Century, and the single worst loss in British maritime history. Captain Sharpe was among the survivors. He later was master of the Laconia when it was torpedoed by U156, taking 2,000 souls to their death, including Sharpe, in September, 1942. Sharpe also was master of the Lusitania, leaving that command just before its infamous sinking in 1915. 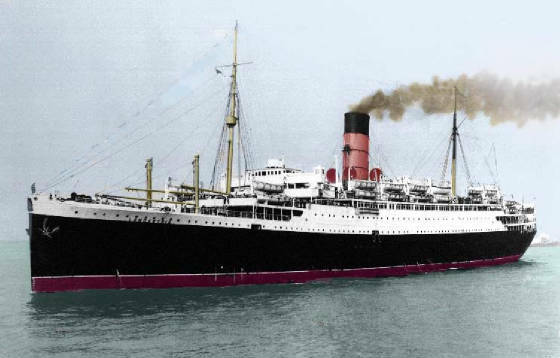 The Lancastria was launched in 1922 under the name Tyrrhenia. But the name was unpopular with Americans who had trouble spelling and pronouncing the name, the Cunard Line changed the name to Lancastria in 1924.